We, at Schuerman insurance, work very hard to get you the best possible rates on life insurance and auto insurance. Our company specializes in finding the best rates for life insurance for families and businesses. We assess each situation individually and craft a policy that fits your needs. We do not try to sell you an overpriced policy so we can make more commission. Your insurance needs are matched against all the policies we carry, and we choose the best one for you. Just about anything can be done online these days-communicating, reading the news, journaling, selling your products or services, applying for credit cards, and teaching courses and taking classes, are just a few of the many things the Internet allows you to do. In particular, shopping or otherwise making specific purchases online is one of the popular options of things to do online, and these days you can purchase just about anything-including term life insurance. Many customers chose to get life insurance quotes on the Internet and then buy their life insurance policy online, and for good reason. 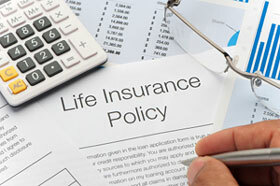 There are many reasons for deciding to buy term life insurance online. For one thing, you can often find affordable and low-cost quotes and life insurance deals at great rates when you shop online. Many insurance companies offer customers discounts when they buy their policy online, because there is no commission involved and company expenses are kept to a minimum. Furthermore, shopping for term life insurance online is much more convenient than going the traditional route. Forget schedules and appointments for that dreaded appointment with an insurance agent-by going online, you can look for term life insurance quotes and compare companies and policies at a time and place that suits you. However, there are a few considerations to keep in mind when looking for term life insurance online (being it 10, 20 year, or 30 year). First of all, shop around. Don't just go with the first quote you get. Take some time to get several different term life insurance quotes before you buy a policy, in order to get the best deal for you. As well, it's important to take time to research the companies themselves-in addition to comparing the quotes-to make sure they're not luring you in with a great quote that you find out later you don't actually qualify for. You'll also want to check with the Better Business Bureau to ensure they're legit and reputable. Also, while you may appreciate not dealing with a life insurance agent in person, this can present a drawback in that you will have to figure out the policy in its entirety by yourself-you won't have anybody to talk you through it in person. However, a good life insurance company online will have customer service agents and representatives to help you should you have any questions or concerns, or should you require any clarifications about the term life insurance quotes or policies. If they don't, take your business elsewhere. The Internet is chock full of term life insurance options, so you don't have to worry about not finding another quote or policy you can feel good about.